The HTC HD2 follows on from last year's HTC Touch HD by using the tried-and-tested formula of stuffing in more features than ever before. Perhaps the most obvious feature is the massive 4.3" display. This capacitive touchscreen panel has a resolution of 800 x 480 pixels, which we think is the largest screen on any production mobile phone. The screen isn't the only thing going for the HTC HD2 - inside is a 1GHz Snapdragon processor coupled with 448 MB of RAM, ideal for running the new Windows Mobile 6.5 Professional operating system. On the back is a 5 megapixel camera with autofocus and dual LED flash, which is one of the best to be found on a Windows Mobile device. This is a dual-band 3G device with HSPA high-speed data support, giving a maximum download speed of 7.2 Mbps and a maximum upload speed of 2 Mbps. 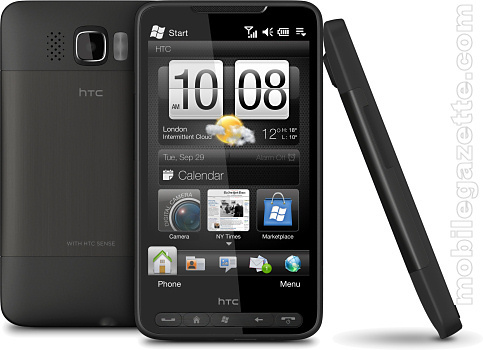 The HTC HD2 also supports quad-band GSM with GPRS and EDGE data, and it also has built-in WiFi. Unlike some other smartphones, the HTC HD2 can be used as a tethered modem and even as a WiFi Router. 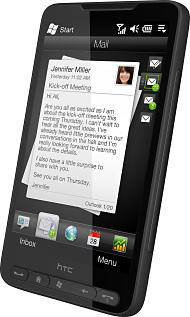 The HTC HD2 has built-in GPS with a digital compass plus HTC's Footprints application. Because this is a Windows Mobile device, then there are a variety of personal navigation applications available. The multimedia player can cope with most major formats, and the large display is particularly well suited to video playback. There is also a built-in FM radio, and the HTC HD2 comes with a standard 3.5mm audio socket. Media files can be stored on microSD expansion cards, and the HD2 also supports stereo Bluetooth. As we said before, this is a Windows Mobile 6.5 Professional smartphone, but as ever HTC cannot resist tinkering with it. The HD2 comes with the "HTC Sense" interface, which is the latest evolution of the popular HTC TouchFLO add-on that we have seen before. The HD2 comes with Opera Mobile for web browsing, plus it can interact with Facebook, Twitter and YouTube. This is all in addition to the usual Windows Mobile features. The software also has some nice touches such as automatically updating for your local time zone when you travel, and the weather tool has some cool animations to give you a feeling for the weather outside. The relatively large 1230 mAh battery is quoted as giving over 5 hours talktime and 16 days standby time on 3G. It's no surprise to find that this is quite a big, heavy device at 157 grams in weight and 121 x 67 x 11mm when it comes to size. That's quite a bit bigger than the iPhone, for example, but then the display is much bigger too. HTC say that the HD2 should be available in select European markets later this month, with other markets (including Asia) following suit later. 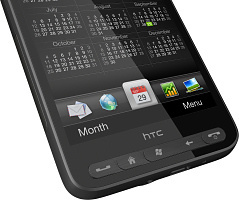 There's no word on pricing, but we should imagine that the HTC HD2 will cost around €700 SIM-free at launch.